If you keep up to date with the news then it is highly likely that you will have read at least one article recently relating to Japanese Knotweed. News reports on this issue appear to be increasing all the time but what are the facts that you really need to know? What is Japanese knotweed and what does it look like? 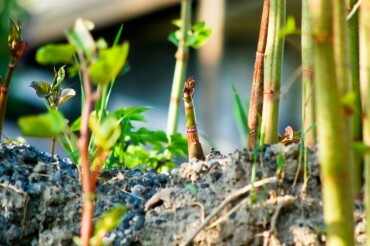 Japanese Knotweed is a fast-growing perennial, which in the spring produces reddish-purple shoots. These grow rapidly in the summer months into tall bamboo-like canes up to 7ft tall and often producing white tassle-like flowers in late summer, before dying back in the winter. It is thought that a gift of a knotweed cutting to Kew Gardens back in the early nineteenth century is the source of most of the Knotweed in Britain. The spread was helped by deliberate planting along railway embankments and river banks as it was thought the dense roots could prevent landslips, soak up water after flooding, and offer privacy from passing trains. Japanese Knotweed sprouts from rhizomes and can grow incredibly quickly and if just a small amount of root is left in the ground it can re-infest. In short, the problems for you as a land owner with Knotweed are that it can cause physical damage to buildings and land, which in turn could reduce value, marketability and insurability. It can be expensive to eradicate and if not adequately controlled can even result in prosecution. How can Japanese Knotweed affect you? If you are selling your property, you are required to state in the Property Information Form (PIF) whether there is any Japanese Knotweed at the property. It is your responsibility to check this point and you must bear in mind that it can die back in the winter, making it hard to spot. If it is present you will need to provide the buyer with a plan, from a licensed company, for its eradication. If you are buying a property, you should be advised of the presence of Knotweed by reviewing the PIF completed by the seller. However, it is also good practice to instruct a surveyor to examine the property; this is something that they should be looking for and you can specifically ask them to check this point if you have any concerns. You should also consider that Knotweed on neighbouring land may in time cause you problems too. If Knotweed is present you may find that your mortgage lender will also require a plan for its management from an eradication company along with confirmation that a transferable (insurance backed) guarantee is in place before they will be willing to lend. This is something that the seller will need to obtain and provide to you as the buyer. The Anti-social Behaviour, Crime and Policing Act 2014, confirms that although it is not illegal to have Japanese Knotweed in your garden you are required to control it. If it is seen to be having a detrimental effect on neighbouring properties the Act could be used to prosecute you as the home owner. What do I do if I discover I have Japanese Knotweed? Home owners are strongly advised against attempting to control the plant themselves as they may not be skilled enough to ensure it is eradicated. Under the Environmental Protection Act 1990 Japanese Knotweed is classed as “Controlled Waste”, which means it needs to be disposed of in special licensed landfill sites. If you have a Knotweed problem it is always best to seek help from a professional. A list of approved contractors can be found on the Royal Institute of Chartered Surveyors website. Can I insure against it? One insurance company has brought a Residential Japanese Knotweed Indemnity Insurance policy to market. However, it is worth noting that the policy itself only gives five years of cover and that the policy is only valid if a Knotweed survey has not been carried out, neither the seller nor the buyer are aware of any Knotweed, and no remedial action has ever been carried out. This means that if you are aware that you have Knotweed on your property this insurance will not work for you or your buyer and you will need to seek the services of an eradication specialist. The Thompson Smith and Puxon Residential Property team can help with all types of residential property matters, in particular, your purchase, your sale or your remortgage. They can be contacted on 01206 574431 in Colchester or 01255 221919 in Clacton or by email at movinghome@tsplegal.com.